Economies and businesses are increasingly vulnerable to natural, social and global economic issues including overexploitation, resource scarcity, ecosystem degradation and climate change. In the response of these dynamics, the concept of sustainability has been gradually developed in the last two decades. 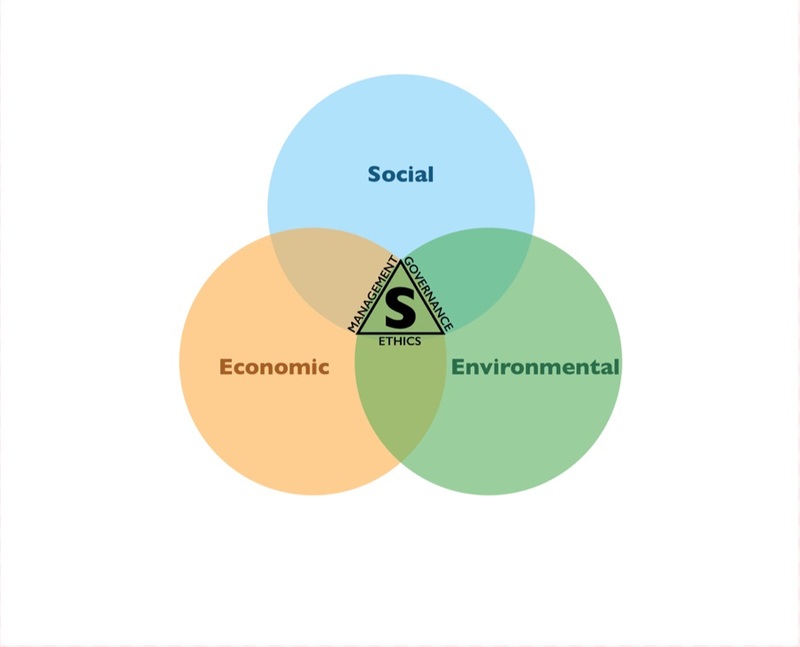 Sustainability is a term used in many different contexts and often mixed up with other terms, such as corporate social investment, corporate social responsibility, social return on investment and others, which each has a slightly different meaning. Without pretending to have an answer to what are the exact differences, we would like to present our own interpretation. At the basis of our vision is the Five Capitals model, which understands sustainability in terms of the economic concept of wealth creation or “capital”. Any organization will use five types of capital to deliver its products and services. 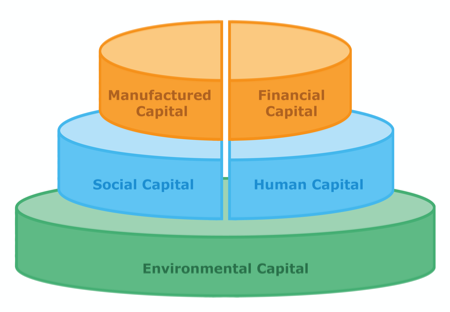 These are: Natural Capital, Human Capital, Social Capital, Manufactured Capital, and Financial Capital. A sustainable organization will maintain and where possible enhance these stocks of capital assets, rather than deplete or degrade them. Long-term financial profitability can only be reached by taking responsibility for managing these capital assets sustainably (see stock/stakeholder report). Companies have impact on their surroundings due to the way they use the capital assets and manage their business, including the type and quality of inputs they use, as well as the human and financial capital, processes, outputs, processing, and marketing. The surroundings are expressed in terms of economic, social and natural capitals. The more companies are aware of these impacts, the more they are inclined to actively influence positive impact or mitigate negative impact. 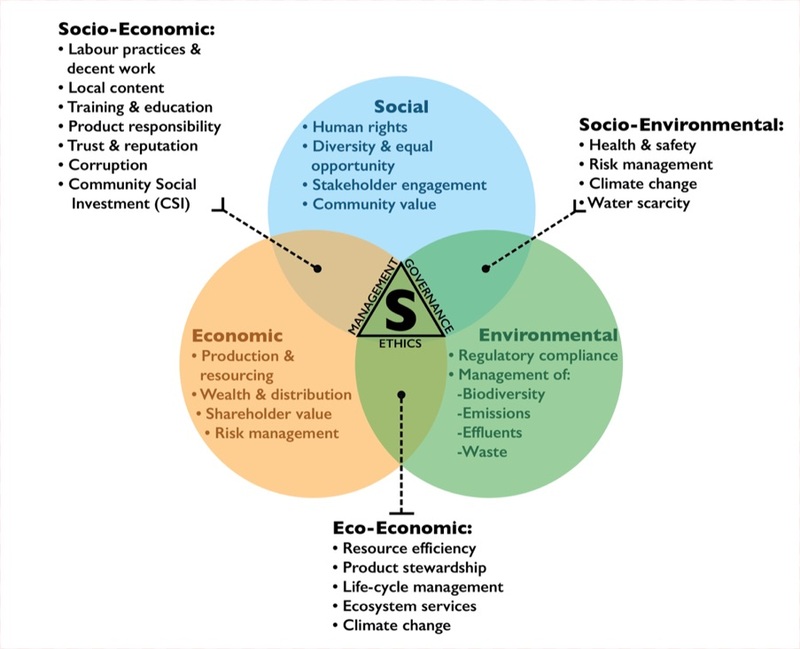 The balance between positive social, environmental and economic impacts will determine the degree of sustainability (S). Click the image below to see it being further developed. As a start, we support positive business conduct and performance by providing Global Reporting Initiative (GRI) certified training on Sustainability Reporting. The Global Reporting Initiative is an international non-profit organization that promotes sustainability reporting as a way for organizations to become more sustainable and contribute to sustainable development. Sustainability reporting is the process of describing an organization’s most critical environmental, social and economic impact, both positive and negative, according to international accepted indicators. The GRI pioneered the world’s most comprehensive and widely used sustainability reporting framework, which provides the methods and metrics to monitor and report on sustainability-related impacts (economic, environmental and social). Organizations, companies and businesses of all sizes and sectors employ the GRI framework to manage and communicate both their financial and non-financial performance in a consistent and effective manner. To build on the created awareness and gained insights during the training, eMJee will support companies, organizations, donors and eventually the government in planning how to address sustainability.